The facilities that RMC uses today were previously part of STX Finland, which in turn was part of the South Korean STX Offshore & Shipbuilding group. A crisis at the parent company forced the closure of the Rauma yard in 2013. A year later, a group of investors, backed by the Finnish government, launched RMC. The premises RMC occupies form part of an industrial park, where a number of other maritime cluster companies also have operations. RMC builds its business on two key cornerstones: high level of competence in project management and cooperation with a network of other companies in the Finnish maritime cluster. “We are recruiting all the time, this is a company experiencing a period of growth,” says Jyrki Heinimaa, CEO of RMC. In the days of STX Finland, the yard alone employed about 1,000 people. However, as RMC relies more on its network of strategic partners than its predecessor, its own staff number is much lower. RMC has decided to concentrate in two main sectors in its newbuilding business: ferries and naval vessels. It also carries out repair work and builds blocks for assembly at other shipyards. Last year, it delivered its first newbuilding, a ro-pax ferry named Hammershus, for Molslinjen in Denmark. 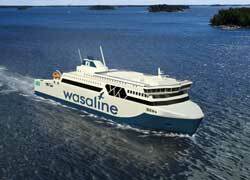 It has a firm order for a LNG/biogas powered 1,500 lane metre and 800 passenger capacity ro-pax ferry from Kvarken Link. Additionally, RMC has an initial contract for a large and fast ro-pax vessel for the Tallink group’s Tallinn-Helsinki service with a price tag of about EUR €250 million. When STX owned what is now RMC, the yard specialised in large ro-pax and cruise ferry tonnage, with Tallink as a major customer. So, in that respect, the current company continues from where the previous one left. The Tallink vessel will follow the principles established by the LNG powered ro-pax Megastar, built by Meyer Turku in 2017, but Heinimaa points out that lots of new thinking will be incorporated in the new ship. The planned Tallink ship would make several crossings a day, which means that its propulsion system will be much in focus. “LNG will again be the principal fuel on the ship, but the design will incorporate a number of additional options, of which batteries are a possibility,” Heinimaa continues. Technology is developing rapidly on the propulsion side and options that only a few years ago would have been prohibitively expensive are becoming tolerable from the cost point of view. “While first generation installations can still be quite expensive, the price will rapidly fall in subsequent generations. This means that propulsion systems based on one or two fuels are starting to give way to multiple fuel options in the future,” he states.